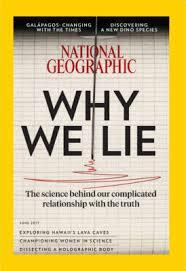 I don’t subscribe to National Geographic although after reading a friend’s copy of the June 2017 issue, I may. The feature article is an in-depth treatise about lying and why we do it. So, what were my key takeaways as a communicator? Lying is a very human thing to do. That doesn’t mean that we are all malicious or untrustworthy, it just means that we all do it. I particularly found the experiments with toddlers interesting. We learn early in life that lying can be advantageous to us personally. We are predisposed to believing what we hear/read, especially when it fits with our internal beliefs. When a friend or acquaintance tells us something, we don’t typically challenge it. That explains why people like Bernie Madoff duped a lot of wealthy (and presumably intelligent) people. Being confronted with facts doesn’t necessarily change one’s belief in a lie. I learned this one by hard experience early in my career. As a woman who values logic and proofs, I believed that these would carry the day when Pampers were attacked by environmentalists – not so. This can be extended to those who believe vaccines cause autism and lately Trump supporters! A corollary to the above point is that undermining lies with facts may have the opposite effect. The article quotes a researcher, Briony Swire-Thompson saying, “People are likely to think that familiar information is true. So, any time you retract it, you run the risk of making it more familiar. The article gave me some additional perspective about why, when confronting issues, it is often not the facts but the height of the passion or the amount of emotional investments that will help people arrive at a truce or a compromise or simply an ‘agree to disagree’ position. Lawyers often encourage those involved in controversy to avoid making apologies that could imply guilt because the consequences could be a costly legal battle and fines or imprisonment. Net, swearing to tell the truth, the whole truth and nothing but the truth is a hard oath to live by – so help me God!